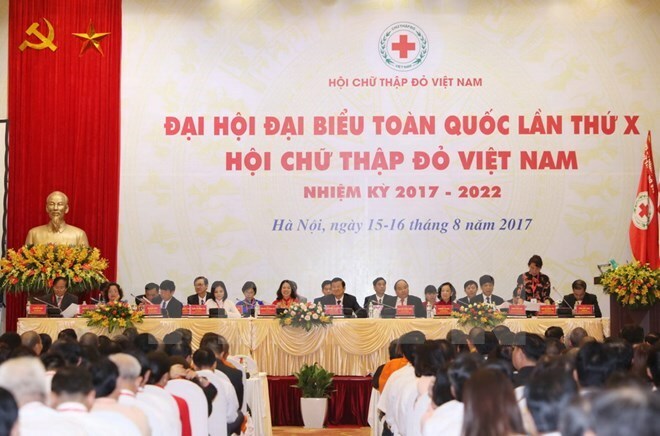 Hanoi (VNA) – Prime Minister Nguyen Xuan Phuc urged the Vietnam Red Cross Society (VRC) to continue revamping its operation based on the community, and in a pragmatic and sustainable fashion. The leader was addressing the 10th National Congress of the VRC in Hanoi on August 16, where he asked the association to bring into full play its coordinating role in humanitarian activities in order to ensure transparency, equality and efficiency of the work. The supportive and caring spirit should be carried forward as Vietnam still has to face various difficulties and challenges, he said, pointing out devastating post-war consequences, frequent natural disasters and high number of the poor and natural disaster victims. The VRC should propose measures to improve the efficiency of the humanitarian work with heed paid to the grassroots level, and reduplicate humanitarian models suitably and effectively, he said. PM Phuc also suggested the association tighten its coordination with relevant agencies, especially the Vietnam Fatherland Front and its member organisations, in tandem with enhancing international cooperation. He highlighted the importance of foreign relations to attract international resources to humanitarian activities in the country and called on the VRC to provide timely support for global natural disaster victims. The PM applauded donors, organisations and businesses both at home and abroad for their support to the VRC over the past time, and called for more joint efforts in the work. Praising the VRC’s performance over the past tenure, the leader said the society has significantly contributed to reducing poverty, ensuring social welfare and stabilising people’s lives. The VRC was founded by late President Ho Chi Minh, who worked as the society’s first Honorary President from 1946-1969. Over the past seven decades, the association has made all-out efforts to fulfill humanitarian tasks assigned by the Party and State.